Reviva Labs August Summer Skincare Giveaway! 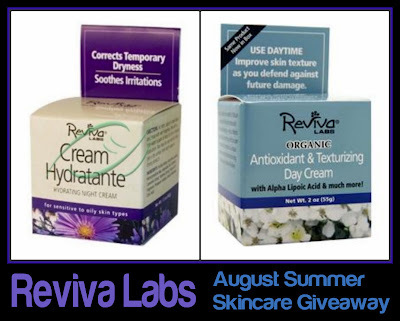 We're continuing the Reviva Labs Summer Skincare Giveaway Series this month with two great products that will hydrate and replenish your skin after a long, hot Summer. Their Cream Hydratante and Organic Day Cream w/Alpha Lipoic Acid are the perfect combination of night and day moisturizers to repair dryness and prevent future damage, while locking in moisture and diminishing fine lines and wrinkles. Cream Hydratante (1.5 oz./$14): This product is intended for use as a night cream, although I have used it as a "spot treatment" on small dry patches during the day. It's very thick and creamy, so I wouldn't recommend using it as a daily moisturizer. It takes a while to fully absorb, so again, this is much better when used at night. The Camomile helps to calm irritation, so it's good for soothing rough and irritated skin as well. I like to use this night moisturizer after a long day in the sun, because it not only feels like it's relieving my skin immediately, it also adds a great deal of moisture to parched skin. In the morning, my skin looks supple and even, and shows no sign of dryness. I simply apply this to my face, throat, and décolletage area by mixing it in the palm of my hand with a bit of water, then applying a light layer with my fingertips. Reviva Labs recommends mixing this product with water when applying, to thin it. I have combination skin, and this product is fine to use with all skin type ranges. This is a multitasking product, because I've used it with great success not only on my face, but also on my elbows, knees, hands and cuticles. It has a very light, subtle fragrance that I can't quite define, but it isn't unpleasant in the slightest. Ingredients: Purified water, anhydrous lanolin, microcrystalline wax, vegetable oils, allantoin, camomile extract, verbena extract, natural oil fragrance, potassium sorbate, sodium benzoate, citric acid. Organic Day Cream w/Alpha Lipoic Acid (2.0 oz./$23): This is my everyday moisturizer when I'm not testing out other products. It performs consistently for me, jar after jar. Alpha Lipoic Acid is a versatile antioxidant, and very beneficial in the signs of anti-aging. This medium textured cream absorbs nicely into the skin without feeling greasy. You'll also find additional beneficial antioxidants in this cream including Vitamins C, E, and a Green Tea Antioxidant Complex. If you're looking for a cream that reduces fine lines, firms skin and promotes skin elasticity, this product has delivered all of those components for me. The prevention of future skin damage is another feature of this cream, so check back with me in a couple of years and I'll let you know if that's the case! Ingredients: Purified water, aloe vera gel (cert. organic), hybrid sunflower oil (cert. organic), vegetable glycerine, emulsifying wax N.F., octyl palmitate, glyceryl stearate, sweet almond oil (cert. organic), cetyl alcohol, veg. squalene, alpha lipoic acid, vitamin E, vitamin C, green tea extract (cert. organic), cucumber extract (cert. organic), DL panthenol, allantoin, soy lecithin, hydrolized soy protein, vitamin A, vitamin D3, xanthan gum, jojoba oil, dimethicone, cocoa butter, rose essence, potassium sorbate, sodium benzoate, citric acid, lavender & ylang ylang & lemon & lime oils. As always, Reviva Labs does not test on animals or use any animal ingredients in their products. As a testament to their belief of producing cruelty-free products, they are proud supporters of the Marine Mammal Stranding Center in their home state of New Jersey. Entry Details: If you'd like to enter for a chance to win this pair of skin care products from Reviva Labs, simply leave a comment below with your eMail. Let me know what your biggest skin care concerns are. I would say that my main concern right now is uneven skin tone from sun spots that are starting to appear and tiny capillaries that I'm noticing around my nose. I envision them growing bigger and bigger each year, yikes! Ah, the joys of growing old! As always, if you aren't comfortable leaving your eMail, please check back on September 1 when I announce the winner and we'll make contect then. Contest entries will be accepted until midnight on August 31. Note: Entries are only open for residents of the U.S., as fulfillment will be made directly from Reviva Labs. *Products featured and prizes furnished by Reviva Labs. My main concerns is random dry spots, so annoying. I'm also trying to eat healthier and relax more to help heal my dark circles. My main concerns is broken capillaries and drier thinner skin as I'm aging. I have those little capillaries too, and aging skin with still occasional breakouts. Best of all worlds! My biggest skin concerns are pimples, I suppose. I have red spots on my cheeks that look like blemishes but they just don't go away. I also have blackheads too. My biggest skin concerns right now is preventing signs of aging and dull skin/clogged pores. My biggest concerns are wrinkles and dark spots.